The experts all say “You stay with your aircraft” but you must make sure that search and rescue can find you by being visible. A “signal strip” set is another mandatory piece of equipment on all aircraft but even this may not be visible at times depending on the location. There must be a more proactive way of attracting the attention of searching aircraft and my good friend Kim Pratley shared the idea of “homemade heliograph” from which we may benefit someday (hopefully not). A heliograph in the aviation context is a very simple and rather effective device for attracting the attention of a search aircraft. I recommend that you always have one on board. It is essentially just a mirror to reflect sunlight. The search aircraft crew can observe these flashes from a surprisingly far distance. Here's what you need. 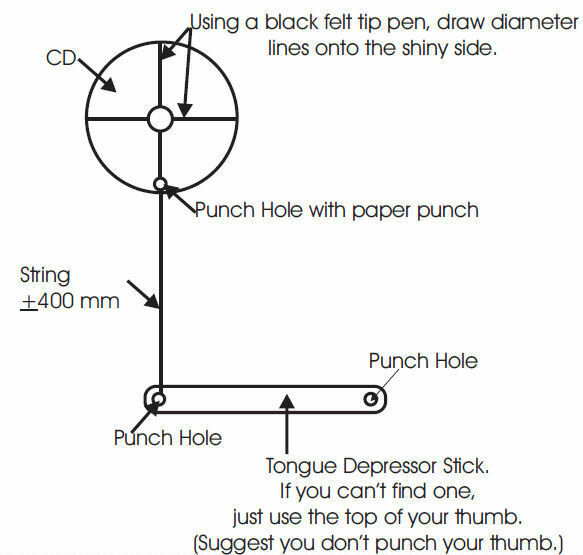 An old CD, a piece of string, a tongue depressor (wide ice-cream stick), a permanent marker and a paper punch. So why the strings and sticks; Why not just a mirror? It's all to do with aiming. At some stage, most of us would have fooled around at school shining sunlight off our wristwatch dial into a victim's eyes on the other side of the class. The task was easy because you would tilt the watch face and track the reflection over the floor and wall until it was in the victim's eyes or sometimes even highlighting some tempting bit of the class sweetheart's body much to the delight of a disparate bunch of unsavoury characters at the back of the class; probably destined to become pilots! The problem with an aircraft in the air is that you can't track the light reflection over the floor and wall to aim it. The string and stick is all about aiming the mirror. It simply interposes a target between you and the aircraft to line things up. Oh yes, if you are planning for a crash, it's also important not to have a breakable mirror. 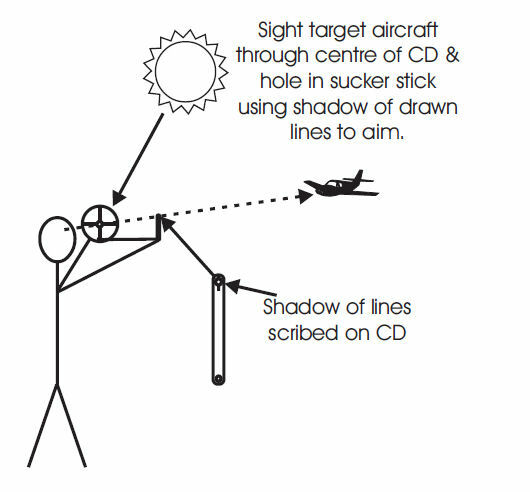 So, why not make yourself a simple heliograph and arrange with friends or family to use it one Saturday afternoon whilst you fly past at various distances to gauge its effectiveness.